The Desert National Park has been popular tourist attraction on Rajasthan tour. Situated near the city of Jaisalmer, it is one of the largest national parks in the country, covering an area of 3162 square kilometers. This famous national park in the Thar Desert near Jaisalmer attracts tourists from all over the world. Your Jaisalmer tour in Rajasthan would be incomplete if you don’t visit and explore the Desert National Park. The Desert National Park offers an outstanding illustration of the ecosystem of the Thar Desert, the Great Indian Desert. Around 20 % of the park is dominated by rippling sand dunes which are also the attractions for tourists. The region is a great haven for resident and migratory birds of the desert, hence it has been a great site for bird lovers. Several species of birds can be seen here. The most common birds you can spot here include falcons, vultures, harriers, common eagles, tawny eagles, spotted eagles, short-toed eagles, laggar falcons, kestrels, sand grouses, partridges, bee-eaters, larks, shrikes, and great Indian bustards. The great Indian bustard is the great attraction of the park. Apart from birds, several types and species of animals can be also spotted here at the Desert National Park in Rajasthan. 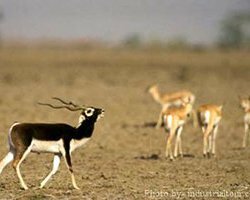 Blackbuck, desert fox, desert cat, Bengal fox, wolf, chinkara, and hedgehog are commonly spotted mammals at the park. Different species of reptiles such as monitor lizard, spiny-tailed lizard, Russell’s viper, saw-scaled viper, and common krait can be also spotted here. Exploring Desert National Park will provide you great tourism experience to cherish for lifetime. Sam Sand Dunes, Indian Bustard, and Gadsisar Sagar Tank are prime tourism attractions. Jeep safari is one of the most popular and most convenient ways to explore the Desert National Park. Jeep safari will enable you explore a wider area of the park in relativity short period of time.